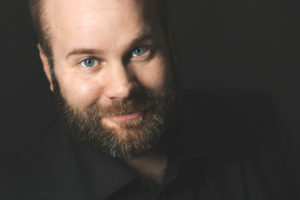 Since his debut 2002 as Papageno at the Drottningholm Court Theatre, Jakob Högström has established himself as one of Sweden’s most interesting and sought after lyrical baritones. With his strong stage presence and impressive text delivery Jakob effortlessly connects with his audience. He studied at Kulturama Stockholm, the Royal Academy of Music in London and the University College of Opera in Stockholm. His successful debut was followed by the title role in Le Nozze di Figaro with Arnold Östman at Malmo Opera, Marchese in Cimarosa’s Il marito disperato for Fäviken Opera Festival and Aeneas in Purcell’s Dido and Aeneas conducted by Mark Tatlow. Jakob has successfully created roles in world premières of modern operas, for example Baines in B Tommy Andersson’s William for the Vadstena Academy and Herr Snipa in Jonas Forsell’s Träskoprinsessan at Malmo Opera. Jakob sang Testo in Monteverdi’s Il Combattimento di Tancredi e Clorinda with the Drottningholm Baroque Ensemble and also with Arnold Östman at Confidencen. He then sang Fallito in Gassmann’s L’Opera Seria with Fäviken Opera and at Drottningholm Court Theater. Jakob sang Baron Zeta in the well praised production of Lehár’s The Merry Widow at Folkoperan in Stockholm. Jakob is furthermore a sought after concert soloist. His repertoire includes the major works of Bach, Handel, Mozart, Beethoven and Mahler. He was soloist in Lars-Erik Larsson’s Förklädd Gud with the Swedish Radio Symphony Orchestra and conductor Thomas Søndergaard in a production by the Swedish Television to commemorate the centenary of the composer’s birth. He has collaborated with conductors such as Arnold Östman, Mark Soustrot, Roy Goodman, Johannes Gustavsson, Håkan Hardenberger, Shi-Yeon Sung and Andrew Manze. He made his debut at Opéra Comique in Paris 2008 as Narbanor in Rameau’s Zoroastre with Les Talens Lyriques and Christophe Rousset and then went on to sing Dandini in a new production of Rossini’s La Cenerentola at Malmo Opera with conductor Brad Cohen. The following season included parts such as Stravinsky’s Oedipus Rex at the Malmö Opera and Pulcinella by Stravinsky at NorrlandsOperan. After that he joined another production of the Magic Flute, this time at Confidencen in Stockholm, where Jakob’s Papageno once again won over the audience with his profound dramatic talent. Among further recent and upcoming engagements to be mentioned are Schaunard in La Bohème at Norrlandsoperan, Marcello in La Bohème at the Malmö Opera, Il Conte Almaviva in Le Nozze di Figaro at Confidencen, the title role in The Son of Heaven at the Vadstena Academy, The Forester in The Cunning Little Vixen at NorrlandsOperan and Frédéric in Lakmé at the Malmö Opera.